Yesterday, cycling down a section of Woodwater Lane, I noticed a corn cockle in the bank. It struck me that I have cycled down the lane many a time, walked down it occasionally, picked blackberries at that time of year, but I have never really paid attention to it. So today I chose to walk to the Love Local Food van in Pynes Hill, and had a bit of a closer look. 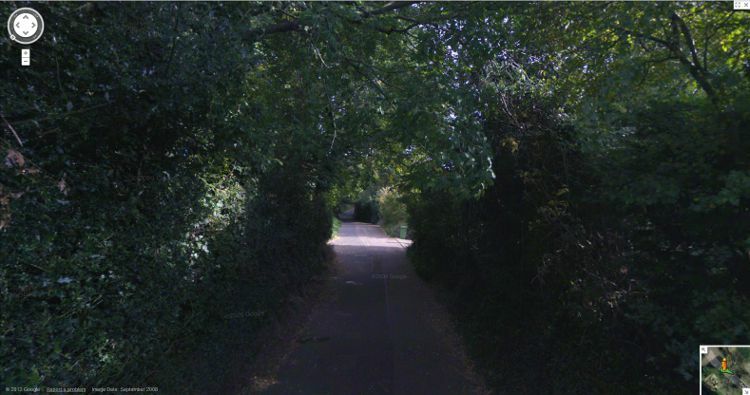 Of course, I forgot to take my camera, so here is a Google Streetview image. The banks are a mix of native trees and wildflowers, and garden escapees. Among the trees are alder buckthorn (I think), ash, birch, fruiting cherry, hawthorn, hazel, holly with and without berries, and wych elm. There are plenty of brambles, nettles and dogrose. As well as the corn cockle, I could make out cuckoo pint, dead nettle, garlic mustard seed pods, hawkweed,herb robert, another cranesbill with smaller pink flower and less-cut leaves, ragwort, some sort of comfrey / forget-me-not / borage / lungwort that I should know, and a capsule fruit with four lobes that I feel I should know too. One thing led to another, as tends to happen on the interweb-thingy. 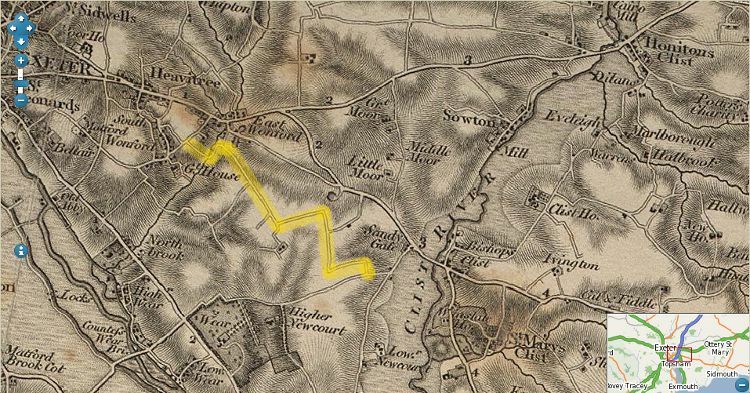 The Vision of Britain website has loads of old maps, and I found the map covering Exeter in the Ordnance Survey First Series 1805-69, scale 1:63360. 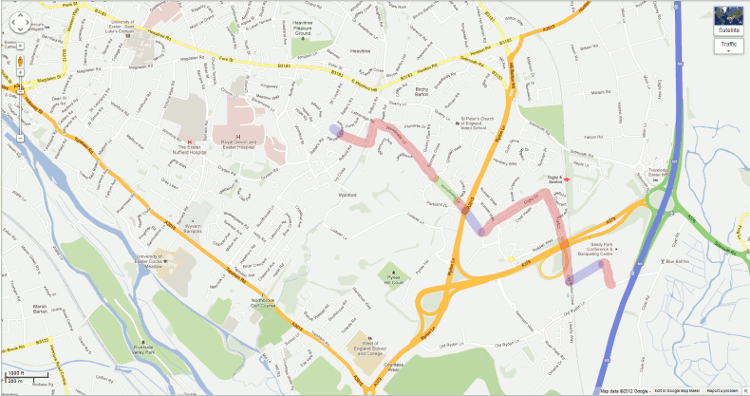 It shows a lane running from Salter’s Road to Old Rydon Lane, highlighted it in yellow below. I don’t know whether Woodwater was the whole lane, but it’s a reasonable conjecture until I have more time to research. The name of the lane reflects the rural nature of the area in times past, and even today under tarmac it looks like an old holloway. The ‘water’ is probably the Northbrook, which it crosses at the northwest end. 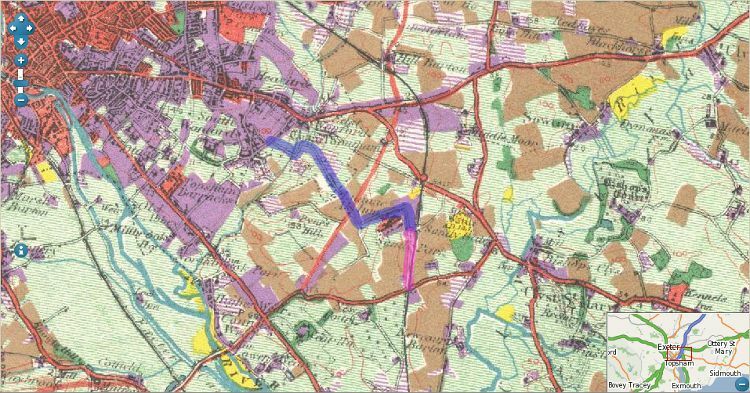 The map from Vision of Britain of the Land Utilisation Survey of Britain 1925-48 shows how the railway cut off the southeastern end of the lane – the original route in blue and altered route in pink below – but also a small patch of green woodland where it originally joined Old Rydon Lane. Wood at one end, water at the other. Nowadays, the expansion of Exeter has changed the lane even more. At the far northwest, it no longer joins Salter’s Road, but a new crescent. The section to the left of the Rydon Lane ring road still exists, but has been blocked to cars at the beginning of the green section. The green is where I walked today, and the Streetview is from the northwest. Beyond that, the red sections still exist as roads, lanes, footpaths or bridges. But the blue sections have been obliterated: the first is now a retail park, and the southeast section a hedge. I now feel the inclination to walk the whole 1800s route, maybe with a wildflower expert, and research a bit more of the history of the place I inhabit. Just came across your blog. Found the Woodwater Lane piece interesting. As a kid, I lived in Whitchurch Avenue and my mum used to take us blackberry or rabbit food picking in Woodwater Lane. We had a bad car crash there too. Seems so strange that its blocked off now. Hi Nicholas. Thanks for your comment. I’m always interested to in people’s memories of the area. Ludwell Valley Park is definitely the place for blackberries at the moment.